Shalom. We will always be delighted to have you with us, and we hope that this brief description of our synagogue and services will help you participate and feel at home in our community. 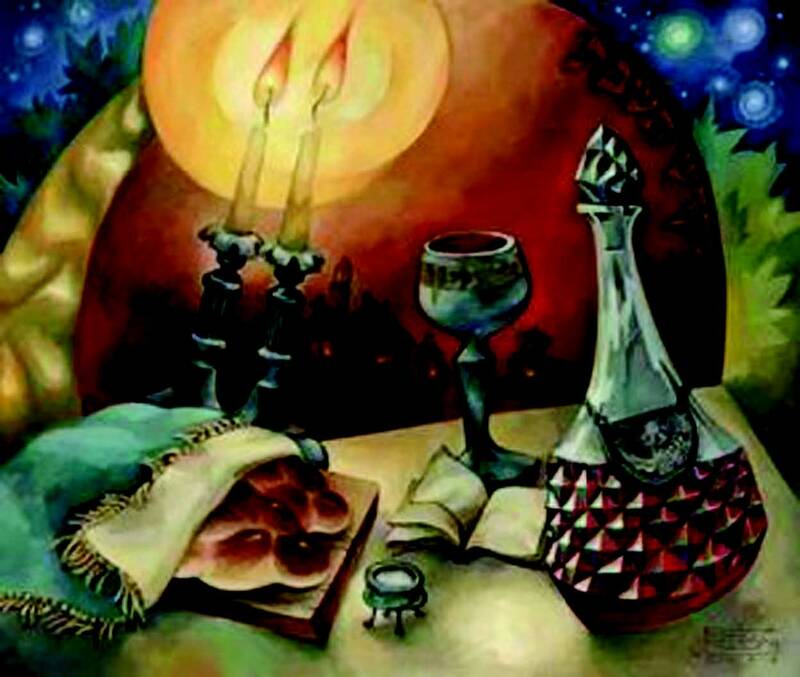 We observe Shabbat from dusk on Friday to nightfall on Saturday. It is our “palace in time,” a day devoted to God, study and sharing meals with family and friends. We ask that everyone help maintain the character of the day by turning off cell phones and beepers, and any other electronic devices in the synagogue, and refrain from taking pictures, making videos, applause, writing, smoking and using the phone. With these distraction sand trappings of the regular week silences, we are able to raise our voices in song, to listen to one another and to ourselves in new and connective ways. We have monthly highlights of Lev Tahor and Cantor Judy Ribnick as well as simhas on many shabatot. PSJC is a welcoming congregation and a friendly place filled alternately with enthusiastic song and powerful silence. Help us sustain our sanctuary as a sacred space. The Service is a place to concentrate and connect. During the service, is is our hope that you too will take advantage of the “holiness” that is often found in this space. Join in with song or simply add your quiet presence to our community in prayer. We understand the potential power of communal prayer AND we appreciate the importance of simply coming together to be with other people. Therefore, even while we ask people to minimize socializing in the sanctuary during services, we encourage you to join us for Kiddush immediately following services as well. It is actually a wonderful opportunity to get to know other members of our community. Children are very welcome in the sanctuary, but we recognize that this is a long service and it is often hard for children to maintain appropriate decorum. When your children need a break, feel free to use the children’s corner in the vestibule room near the entrance. An array of toys and books is available. So that you can continue to follow the service while you sit with your children, speakers have been installed in the vestibule room. Several different children’s Shabbat services also are offered. Feel free to sit anywhere you feel comfortable. 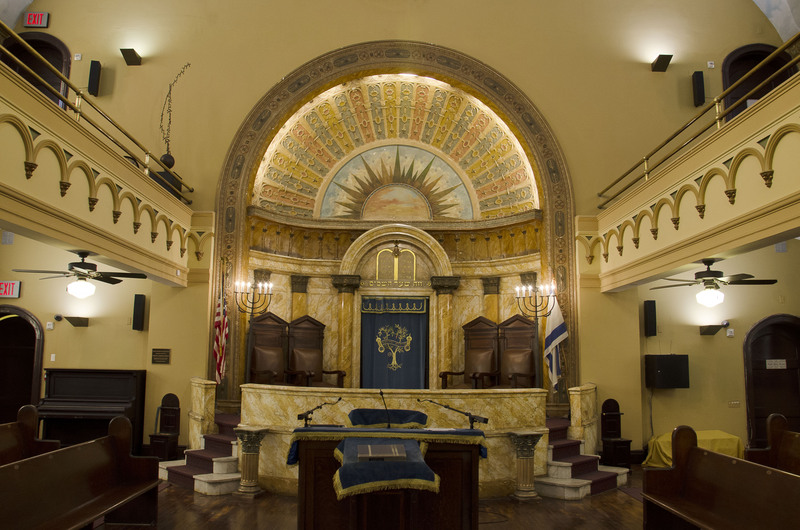 At the front of our sanctuary is the Bimah, the focal point of the sanctuary, and the Aron HaKodesh (Holy Ark) containing the Torah Scrolls (the five books of Moses). The curtain covering the ark in our shul is inscribed with the Etz Hayim (Tree of Life) which represents the Torah. Above the Ark is the Ner Tamid (Eternal Light), recalling the perpetually lit menorah in the ancient Temple in Jerusalem and symbolizing God’s constant presence among the Jewish People. As a sign of respect for God, we ask that everyone (men and women) wear a head covering within the synagogue building. A variety of head coverings are available in the back of the sanctuary. Everyone (both men and women) called to the Bimah for an honor should wear a head covering and a Tallit (prayer shawl). If you leave the sanctuary to visit the bathrooms, please leave your Tallit on your seat, and at the conclusion of services, please replace the Tallit on the rack at the back of the sanctuary. The congregation rises when the Ark is open, when the Torah is lifted, and for the recitation of certain prayers. Page numbers will be announced at times during the service, but if you get lost, feel free to ask for help. Services are conducted mostly in Hebrew, with occasional readings in English. A transliteration of the Hebrew prayers is available on the table at the back of the sanctuary. We pray from Siddur Sim Shalom, which draws its text from the Bible, Talmud, and other classical sources, as well as modern interpretations. It also includes prayers and poetry composed over the last 2000 years. Although the siddur uses traditional male references for God, PSJC is an egalitarian congregation and our practice is to substitute gender neutral terms (e.g. “ruler” for “king,” “Adonai” for “Lord”).The central part of the Torah Service includes chanting selections from the Bible, which are contained in the larger book, the Chumash (Five Books of Moses). We have a variety of Chumashim available, including Etz Chayim, published by the Rabbinical Assembly, The Torah a Modern Commentary, published by the Union of American Hebrew Congregations, and the Stone Chumash, published by Mesorah Publications. In addition to the Biblical text in Hebrew and English, these Chumashim include a variety of commentaries to expound on the the text and to encourage each of us to join in this never-ending conversation. As a sign of respect, please do not place these books on the floor.